Dakine Storm Ladies Liner Glove is made with mid-weight stretch fleece and designed as an underglove for extra warmth in very cold weather. 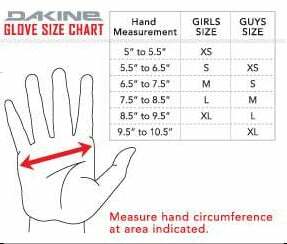 Have you found the Dakine Storm Ladies Liner Gloves 2019 Shark Grey Cheaper? Storm Ladies fleece liner glove from Dakine, for extra warmth in very cold temperatures. Made with a mid-weight fleece which has 4-way stretch for comfort. there is a silicone gripper pattern on the palm and the first finger and thumb are touch screen compatible, making it easy to get things out of pockets or use a smart phone without taking off your liner gloves and your hands getting cold. What do you think of Dakine Storm Ladies Liner Gloves 2019 Shark Grey?